When ski runs, hiking trails and gorgeous scenery make people fall in love with Summit County, it’s no surprise people’s passion for the surrounding environment creates news every year. And when national forest makes up more than three-quarters of Summit, stories about the land that belongs to all of us regularly make headlines. In 2014, forest managers and local residents clashed over how to handle all the dead trees left in the wake of the pine beetle. The year also marked the 50th anniversary of the landmark Wilderness Act, which heralded celebrations and a renewed push to protect more land as wilderness areas in Summit. County representatives worked throughout the year to preserve Summit’s water in the first-ever Colorado Water Plan, and they conserved land through purchases of private backcountry properties. 2014 brought new Forest Service guidelines that paved the way for ski areas to add more summer activities like zip-lining and prompted review of the environmental impacts of new construction at Breckenridge Ski Resort. Lastly, in a landscape dotted with the remnants of mountain mining, the year marked milestones in local cleanup efforts and water quality improvements, including at Colorado’s most toxic mine, the Pennsylvania. Voters approved tax funds for environmental reclamation, and Climax Molybdenum, the giant mine operating in southwest Summit, debuted its $200 million water treatment plant. Starting in January, residents began vocalizing opposition to the Forest Service treatment of land between Breckenridge and Frisco, known as the Ophir Mountain project. Logging operations in the winter and spring left much of the area devoid of trees, and by April public sentiment against clear-cutting overwhelmed a meeting of the Forest Health Task Force, part of a local land trust nonprofit. Opponents included Summit County author and historian Mary Ellen Gilliland and other longtime residents. At several task force meetings throughout 2014, residents argued with Forest Service officials about the best way to manage the land, debated the benefits of trucking dead trees to the Gypsum biomass energy plant and pleaded with them to reconsider the clear-cuts, especially around popular trails. The Forest Service announced in June more cutting would start in three different areas, and no more was planned for the rest of the year. Foresters held a poorly attended afternoon meeting in August to encourage the public to give input on cutting planned for areas around Keystone. With the beetle epidemic having subsided, the Colorado Bark Beetle Cooperative met in October to discuss how to use relationships built among groups that historically sued one another to help communities through future forest changes. At the meeting, two Summit County representatives received praise for the county’s pilot chipping program that aimed to create wildfire protection barriers around people’s homes by collecting their trees and branches and sending them to the biomass plant. The bill, considered one of the nation’s greatest conservation achievements, limits activities in designated areas to non-motorized recreation, scientific research and other noninvasive pursuits. The law also prohibits logging, mining, oil and gas drilling, bicycles, road building and other development. In September, the act celebrated its 50th anniversary with special events in Summit to recognize the history of the county’s two wilderness areas, the Eagles Nest and Ptarmigan Peak wildernesses, and draw attention to the perils they face. Local advocates said the land is still jeopardized by congressional inaction on conservation. Wilderness areas face threats from encroachment of development and oil exploration to invasive plants, damage from illegal mechanized activity and erosion caused by hikers. As Colorado’s population exploded over the years, renowned nature photographer and Silverthorne resident John Fielder said he’s seen fewer people venturing into the wilderness’ more rugged parts. The more people use wilderness, the more nature has the potential to be abused, he said, but if people don’t experience the wild places they won’t become advocates for protecting them. In August, U.S. Rep. Jared Polis announced in Breckenridge the reintroduction of a bill that would designate more wilderness in Summit, bringing up an old resentment from a small group of motorized users who feel the bill is an attempt to further restrict where they can ride. Folks who see Summit surrounded by frozen water for half the year sometimes forget that the blue gold is the most fought-over resource in Colorado and the West. County representatives sought local input in 2014 while they worked on a water plan for the Colorado River Basin. The basin is one of eight in the state with roundtables helping to shape the first-ever Colorado Water Plan, which aims to guide the way water is used and conserved among competing interests for the next 50 years. The plan was a large focus of the 21st annual State of the River in Frisco in May, and in December, Gov. John Hickenlooper presented the draft of the plan, which will be debated, refined and finalized over the next year. Though Summit and West Slope critics said the draft isn’t specific enough about a new transmountain diversion, conservation measures or ecological rights and worried their voices wouldn’t be heard over more powerful interests, they called the lengthy document a huge step forward and remained optimistic about compromise and collaboration. Summit County government officials also worked to protect land in 2014 through the purchases of 16 land parcels for $1.4 million using the voter-approved Open Space Fund. The county secured protections for 363 acres of wildlife habitat, historic sites, outdoor recreation areas and scenery. Notably, the areas protected include the Sts. John town site near Montezuma, the Laurium Mine property on Bald Mountain in Breckenridge and two 25-acre national forest private inholdings in the Swan River drainage. The county Open Space Program, established in 1996, is funded by a voter-approved tax that provides about $1.2 million annually for property acquisition. The program has preserved more than 15,000 acres of land through purchases, donations and conservation easements. Also in 2014, county staff fought for public access on an old road near Quandary Peak now running through private land and against commercial use of private property northeast of Breckenridge zoned backcountry. In April, the U.S. Forest Service released new guidelines that help national forest managers decide what to allow or not allow when ski areas propose adding canopy tours, observation decks and mountain biking trails with the goal of attracting more summer visitors. The guidelines came from the 2011 Ski Area Recreational Opportunity Enhancement Act, sponsored by two Colorado representatives, and Forest Service employees in Summit spent much of 2014 analyzing the environmental and social impacts of new construction and use at Breckenridge Ski Resort. They sought comments from residents and other concerned groups, received many in support and opposition and conducted extensive field work in the summer and early fall. In August, the Forest Service approved most, but not all, of a similar summer-use proposal at Vail Mountain, hinting at what could be approved at Breckenridge, though officials said the Breck community and ski area environment are significantly different from those of Vail. Dillon Ranger District leaders have said the Breckenridge summer-use environmental impact statement should be released in the first few months of 2015. Cleaning up old mines and restoring river habitat for fish and other wildlife will be a task that keeps Summit’s government agencies, nonprofits, volunteers and others busy for generations. The process may seem endless, but each small step they take visibly shows in the landscape. In 2014, partners tackled some of the worst aftermaths of mining in Summit, including the state’s most toxic mine. Inside the Pennsylvania Mine, a giant bulkhead, or concrete and steel plug, was installed in October. Once the second plug is finished next year, the mine’s heavy metals will stop acidifying water, killing fish and preventing aquatic life in the streams and rivers near Keystone. Just north of Breckenridge along Tiger Road, work continued this summer on the restoration of the Swan River, turned upside down by dredge mining. 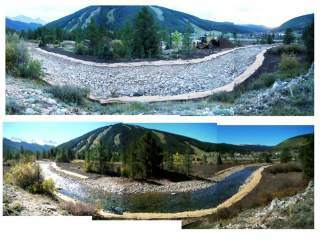 In September, the Forest Service, Blue River Watershed Group, Copper Mountain Resort and Climax Molybdenum mine completed the first phase of restoration to a section of the Tenmile Creek near Copper damaged by mining and logging, railroads and highways. The project is expected to take four summers and cost $800,000. Grant funding can be difficult to come by for reclamation projects, and in November, voters approved a property tax increase, in part, to fund more water-quality improvements, mine cleanups and hazardous waste collection. In August, Climax Molybdenum, a massive mine operating in Summit that produces a rare metal, publicly unveiled its new $200 million water treatment plant. At 10,500 feet above sea level, the plant started discharging into the Tenmile Creek about 5 miles south of Copper Mountain Resort in July. The plant was built to replace the former second stage of the mine’s water treatment system, a tailings pond now used to deposit leftover rock from mining operations that restarted in 2012 after a 17-year hiatus. Since January 2012, the mine, an economic giant in the High Country, has paid Summit County millions in taxes as the county’s largest private landowner. Government officials and representatives lauded Climax’s environmental protection and reclamation efforts. Earlier in 2014, the state denied a request from Climax to increase the maximum amount of molybdenum it can release into Tenmile Creek. The Colorado Water Quality Control Commission currently regulates a maximum concentration of 210 parts per billion for water used for drinking supplies, and Climax proposed raising the limit to 3,967 parts per billion. Local officials said the jump was a concern, though they agreed Climax has long been committed to environmental protection standards and was arguing for a revised limit based on new research. In June, the state and the federal EPA denied the request saying they disagreed with Climax’s science and would revisit the issue in two years.